In Britain, modern architecture from the 1960s is frequently vilified and misunderstood. As Adrian Forty has suggested, 'it seemed (whether it really did so or not) always to have ridden on the shoulders of the welfare state, and so in turn was honoured in the welfare state's prime, then maligned when the welfare state was condemned as anachronistic'. Some British historians have suggested that modern architecture – represented most infamously by wide-ranging demolition and reconstruction, and by high-rise housing – was a rude interruption in what would otherwise be a satisfying continuity from past to present. They tend to paint modernism as especially aggressive, forgetting that previous generations, notably the Victorians, were often more aggressive in their large-scale redevelopments and so-called 'restoration' of historic buildings. They also tend to forget that, in the mid-1960s, it was highly ornamented nineteenth century architecture which was itself understood as the rude interruption in the continuity of architectural history, imagined as bombastic and distasteful, as a relic of a dark, stuffy hierarchical past in a bright new technological post-war age. There is now an ongoing and widespread erasure of 1960s modern architecture from the fabric of British cities; sometimes because of social problems, technological failures and lack of maintenance, sometimes because of the increasing economic value of the sites that buildings occupy, but also imagined as the cleansing of undesirable edifices. Owen Hatherley has written about this phenomenon. He recalls J.B. Priestley's pre-war characterisation of three Britains: first, the patchwork of fields and stone walls of the agrarian landscape; second, the brick and iron landscape of the industrial revolution; and, third, the 1930s landscape of cinemas, arterial roads and Tudorbethan suburbia. To these three, he adds Britains number four and five: 'the country of the postwar settlement, of council estates, Arndale centres and campus universities'; and 'the post-1979 [Britain] of business parks, Barratt homes, riverside “stunning developments”, out-of-town shopping and distribution centres'. 'The ambiguous remains of the fourth' Britain, he claims, is marked by 'the fifth's frequent determination to wipe out any architectural trace of it, just as it tries to decimate the remnants of its collectivist politics'. Although Hatherley's turn of phrase might seem melodramatic, he is right that post-war modern buildings have been removed disproportionately from prominent sites in British provincial cities in recent years. It is in this context that we have carried out a handful of projects reworking 1960s modernism. We have produced three designs adapting three modern buildings from the 1960s on the Newcastle University campus. Part of the massive expansion of British universities funded by the University Grants Commission, aimed at promoting science and technology, the buildings were originally designed by Richard Sheppard-Robson and Partners and completed between 1963 and 1970. Abandoning Newcastle University's previous masterplan, they were seen at that time as a fragment of a futuristic new city; slab blocks and a tower in brown brick set around a broad lawn. According to the Newcastle and Gateshead Pevsner guide, the architects saw their work as making 'an atmosphere of massive calm among the warring elements'. 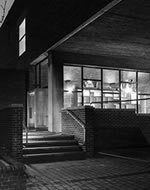 Part of our contribution has been to re-interpret the original values of these buildings in a University community where, now, they are frequently perceived to be alien. In our design approach, we aimed to value the existing buildings as representatives of a 1960s culture which is now hard to recall: when it seemed like an new technological age was about liberate people from the past – not just by supplanting a drab pre-war world with a bright, meritocratic, technological present, but also by overcoming a prevailing nostalgia for the past with a new image of the future. Our approach has been to accept and work with the buildings' values, to strip back the clutter that institutions inevitably collect, and to pay attention to the values that the buildings display. Specifically we have helped to reinstate the legibility of the buildings' circulation. The buildings' routes were imagined in terms of their functional efficiency, part of a rational, technological architecture for a scientific future. The buildings were built with multiple entrances at a time when the single hierarchical entrance – the stereotypical grand door with a reception desk – was considered stuffy and anti-egalitarian, and when circulation was contrived not as a device for aggrandising certain rooms but, rather, in terms of maximum efficiency. We sought to maintain the buildings' flattened hierarchies, maintaining and developing their multiple entrances and their circulation patterns. We have used fine materials, plainly detailed. The original buildings' rational plainness is now found to be at odds with the values of a contemporary University which sees itself in terms of its history and distinction. So we have added deep timber thresholds, substituted aluminium doors with oak, aluminium door handles with leather, and concrete paving with granite. The fineness of these materials adds some of the architectural distinction which was perceived to be missing. We also added details and materials which refer to a longer architectural history. One of the reasons that the buildings have become, apparently, undesirable and misunderstood is that they were designed to refer to a future that few can now remember, rather than referring to a longer past. The idea that architecture should refer to the past still seems to remain a widespread expectation in Britain - despite the values promoted by modernists in the 1960s - and continues to be perceived as missing in modern buildings. So we have, for example, added oak battens to concrete surfaces, both tempering the material and quoting Alvar Aalto's reference to the fluting of classical columns, and we have added timber cabinets whose proportions make reference to Le Corbusier's famous Unite d'Habitation in Marseilles. The materials themselves - oak, granite, leather, mosaic - have a long history with rich associations, and the details add further resonance through the acknowledgement of their richness in architectural history. The future that these buildings were imagined to represent in the 1960s – and which was understood as a cause that required the rejection of the past – is now largely lost to us. In order to make them more acceptable in contemporary culture, through our work, we have sought to add the references to the past which many people now find to be missing. We have chosen to refer to the icons of modernism alongside a longer politics of materials. In doing so, we recognise that the future imagined by modernism is now out of reach, and that modernism has itself become part of a long history in architecture. But our details – with their quotations of Aalto and Corbusier – attempt to reinforce an idea of history which includes modernism, not a history which seeks to reject modernism as alien. 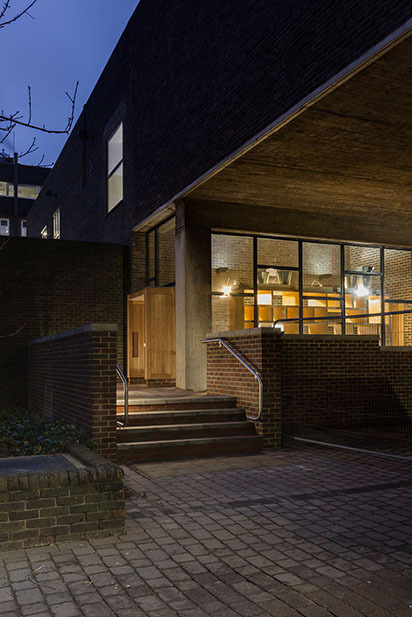 The projects have attempted to retrofit the future of the 1960s with a past, equipping these modern buildings with the history of modernism itself.